I brought home two bottles of wine made by the movie producer Francis Ford Coppolo. A Claret, an English term for a Burgundy, and a blended wine called a Pinot Noir. I typically stay with the organic sulfite free wine as I am quite allergic to the preservative called sulfites. But, I was curious and the bottle labeling won me over. The Claret was very good and it must have had a low sulfite content as I had a slight allergic hot feeling reaction. When I got around to the Pinot Noir, it tasted very good and later I was burning up. There was obviously something added to the Pinot Noir that was different from the Claret. The Claret tasted better compared to the Frey Organic Sulfite free wine. The Frey Organic Sulfite free is in the $10 – 12.00 range and the Claret is in the $13-14.00 range. If both wines are using a similar priced grape how is there such a difference in taste? I was curious, how do the wine producers make lower priced wines taste good? With a little research, I found wine manufacturers have up to 60 different F.D.A. approved additives to adjust the taste and clarity of the wine being produced. The goal is to take a large volume of grapes and then use science to craft something that tastes much better than if it was left to nature. My allergic reaction with the Pinot Noir is telling me there was a lot of extra work done to get the desired taste they wanted from those grapes. 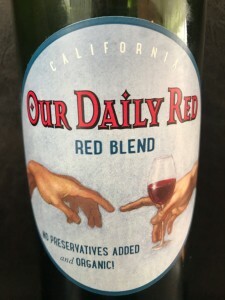 The organic sulfite free wine label suggests they did nothing to the grapes other than wash them off before fermentation and afterward just put it in a bottle. The feed back I have gotten from patients is very interesting on the organic wine. Some just do not like the taste and they buy sulfited wine and use a sulfite filter. Some don’t mind that the taste is not as mellow and are like me, they are happy to have a chemical free wine and no allergic reaction. I found that if I uncork the bottle and let it set for 10 minutes the airing does help the taste. The additives to wine adjust for clarity, acid changes for taste, and sulfites for preservation. There is a taste difference with the chemicals and a storage extension with sulfites and I am impressed with how well it works. I do believe that it is safe to say that wines made in small volumes from highly regarded wineries using grapes with specific properties require minimal manipulation to become an outstanding wine. I do know from talking to a few owners of these smaller wineries that some use very little sulfites and are conscientious about what goes into the bottle. But, with that said, I am equally impressed with the organic sulfite free wine maker’s tenacity to produce a consistent product without all the manipulation. If sulfites bother you try the Frey and Our Daily Red brands at the local grocery stores. The best way to find out on a nice cold day like today is to run your own experiment. Find what you like and what likes you. For me, beef stew with lots of vegetables on a cold day with a glass of organic wine is in the making, but no more Pinot Noir.